ALABAMAWORKS! UPDATE NEWSLETTER - SEPTEMBER 2017 - AlabamaWorks! The AlabamaWorks 2017 Workforce Conference was postponed due to Hurricane Irma and its impact on Alabama. The conference had been scheduled for Sept. 12 and 13 at the Renaissance Hotel and Conference Center in Montgomery. We will update you when the conference is rescheduled. That was the lead paragraph of the top-of-the-page article in a Dothan Eagle special report on Aug. 25. The article, by Dothan Eagle staff writer Jimmy Sailors, looks at the critical role AIDT performs in helping meet the workforce needs of industry. 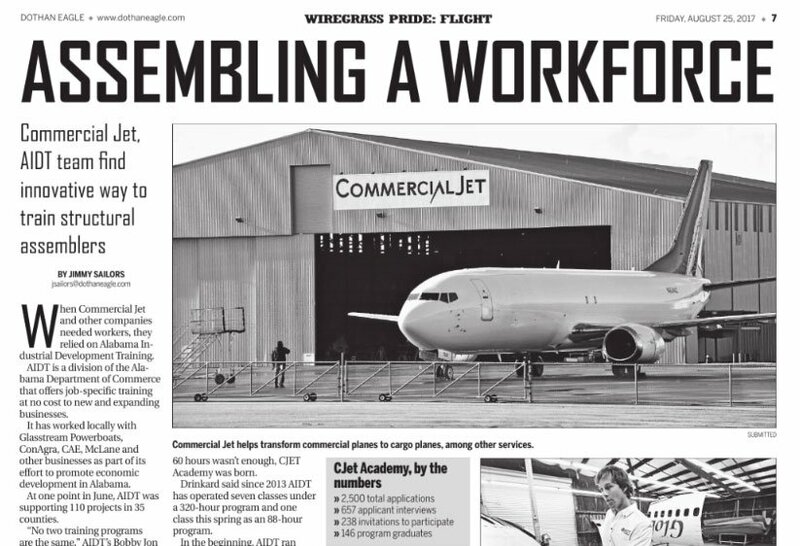 It highlights AIDT’s CJet Academy, a collaborative training program for Commercial Jet, which converts commercial planes to cargo planes and operates at Dothan Regional Airport. The story only got better, with a plug from the Dothan Area Chamber of Commerce. “For Dean Mitchell, executive director of the Dothan Area Chamber of Commerce, AIDT provides a solution for new and expanding businesses looking for workers. “From the Chamber’s perspective and from an economic development recruiting perspective, they’re an integral part of our efforts to go out and try to lure industry to come to Alabama,” Mitchell said. This story is a great testament to the work of AIDT. Click the image below to read the full story. A guest column by Ed Castile, deputy secretary of the Alabama Department of Commerce/Workforce Development Division and executive director of AIDT, was featured this week on AL.com, Yellowhammer News and the Alabama Political Reporter. In the column, Castile noted the progress Alabama’s workforce system has made in the past several years, including the unification of all the state’s workforce players under the AlabamaWorks brand. “What began several years ago as a vision for developing a skilled workforce and ensuring continued industry success is now a reality,” Castile wrote. 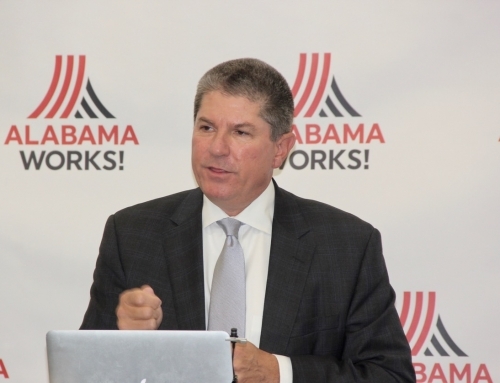 “In November 2016, AlabamaWorks officially launched, bringing together all the components of Alabama’s workforce development system under one brand. The steady decline in Alabama’s unemployment rate continued in August, dropping from 4.5 percent in July to 4.2 percent. That is well below August 2016’s rate of 5.9 percent, and below the national average of 4.5 percent. The comparable national unemployment rate for August was 4.4 percent, up slightly from July’s rate of 4.3 percent. The last time Alabama’s unemployment rate was below the national rate was in October 2013. According to data released by the Bureau of Labor Statistics, Alabama had the largest unemployment rate decrease in the nation, both over the month and over the year. Alabama’s unemployment rate dropped by 0.3 percentage points from July to August, and 1.7 percentage points from August 2016 to August 2017. August’s rate represents 90,913 unemployed persons, compared to 96,158 in July and 128,413 in August 2016. The last time the number of unemployed was at or below 90,913 was in August 2007, when it measured 89,206. Over the year, wage and salary employment increased by 28,300, with gains in the leisure and hospitality sector (plus 9,600 jobs), the professional and business services sector (plus 7,600), and the construction sector (plus 6,500), among others. Wage and salary employment increased in August by 3,100. Monthly gains were seen in the government sector ( plus 3,100), the professional and business service sector ( plus 2,700), and the education and health services sector (plus 2,200), among others. Alabama was also one of only six states to have an increase in wage and salary employment in August. All counties, major cities and metropolitan statistical areas experienced drops in their unemployment rates, both over the year and over the month. Alabama Department of Labor Secretary Fitzgerald Washington recently announced that up to $10 million in federal grant money is available to the ADOL Inspections Division’s Abandoned Mine Land Program (AML) for pilot projects with the potential to create long-term economic benefits for counties with coal fields in the northern half of Alabama. The program is seeking economic and community development proposals that will attract new industry and jobs to the state’s counties historically impacted by the downturn in coal production. 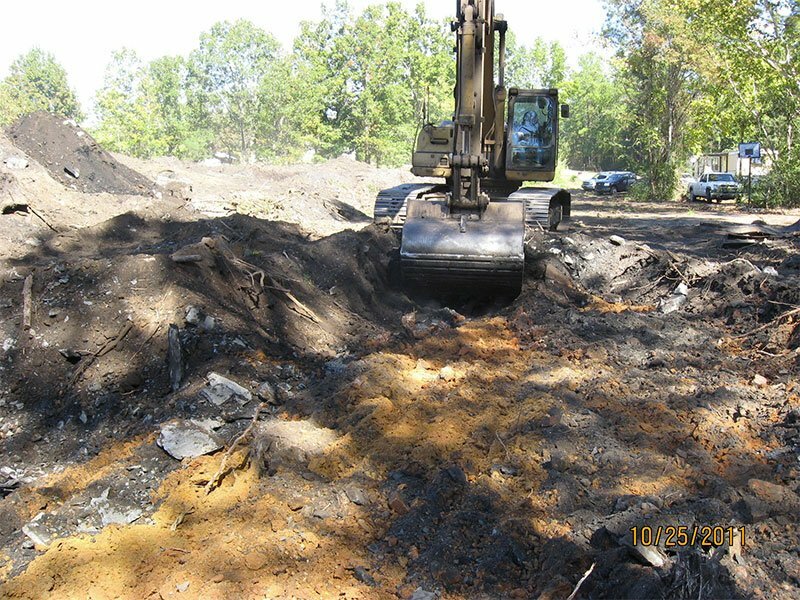 To be eligible for the funding, projects must be on abandoned mine sites that historically have been mined for coal and have the potential for long-term success. Counties eligible for projects include: Bibb, Blount, Cherokee, Cullman, DeKalb, Etowah, Fayette, Franklin, Jackson, Jefferson, Lamar, Madison, Marion, Marshall, Shelby, St. Clair, Tuscaloosa, Walker and Winston. The Pilot Program is part of $105 million in funds that have been set aside for one-time grants to Appalachian states to return coal sites to productive uses that will bring new jobs to replace the thousands lost during the downturn of the industry. For more information, including how to submit grant applications, click here. The Alabama Department of Labor is hosting a number of job fairs and job-seeker workshops in the upcoming months. For a listing of upcoming job fairs, please visit www.joblink.alabama.gov. The message from Alabama employers to educators carries a consistent primary theme across all industry sectors. What those industries are most commonly citing is a need for employability skills, says Josh Laney, senior director for Workforce Development for the Alabama State Department of Education. In response, Laney says, ALSDE’s Office of Career Technical Education and Workforce Development continues to seek out ways to better prepare students with the workplace skills needed to meet that demand. This school year, the Career Coaches who work in our high schools across the state will have a new tool in their kit. Created by an Alabama company, Smart Solutions Group Inc., “Smart Work Ethics” is a curriculum developed to create an understanding of workplace ethics, sometimes referred to as employability skills, soft skills or essential skills. Laney says this year, all high school career coaches in the state were able to receive a training kit and a classroom set of student materials to be used in their work with high school students. Laney says the ability of career coaches to provide increased employability training in a uniform manner is one more step in ongoing efforts to prepare Alabama students in every way possible for the real world. For more information about the Alabama State Department of Education’s Career Technical Education and Workforce Development programs, visit the ALSDE website. A dual enrollment partnership among Huntsville City Schools, Drake State Community and Technical College, and Science and Engineering Services, LLC, will give some Huntsville students the opportunity to learn advanced aviation manufacturing skills. “It’s a win for our community. 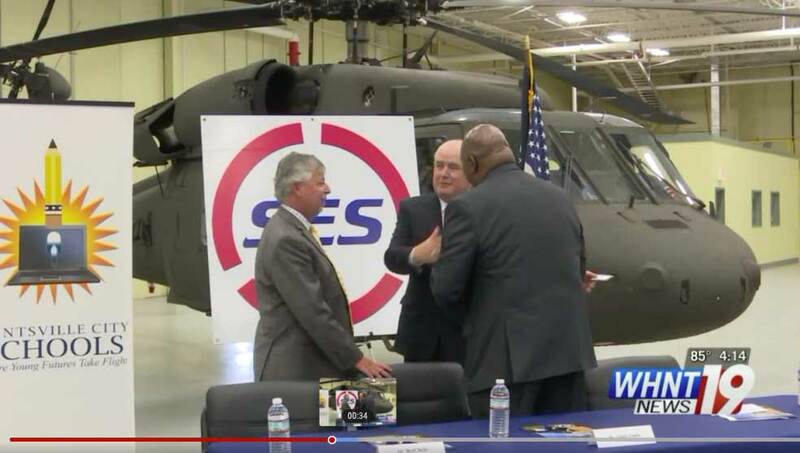 It’s going to allow a training capability to young kids to come in, get the training they need, and move directly into the manufacturing or aviation fields,” Science and Engineering Services CEO E.J. Sinclair told WHNT TV in Huntsville. Click the image below to watch WHNT’s story about the partnership. The Southwest Alabama Workforce Development Council (SAWDC) recently announced its transition to the AlabamaWorks brand. Here’s what SAWDC said about the transition. “In the fall of 2015, the Alabama Workforce Council undertook a statewide effort to understand the structure, function, organization and perceptions of the Alabama workforce system. The results showed that Alabama is endowed with plentiful state, educational, business support and other service organizations that provide training, placement and informational resources that could better serve business, industry and the public if they were organized in an effective network and unified under a common vision, mission and brand. This new and unified system resulted from hundreds of hours of input from workforce and educational professionals, industry leadership, families and students. Thousands of Alabamians participated in person and online in developing the charter for AlabamaWorks. “With these new and exciting advancements, SAWDC, as part of the State’s Regional Workforce Council substructure representing Region 7, will be transitioning to SAWDC AlabamaWorks. 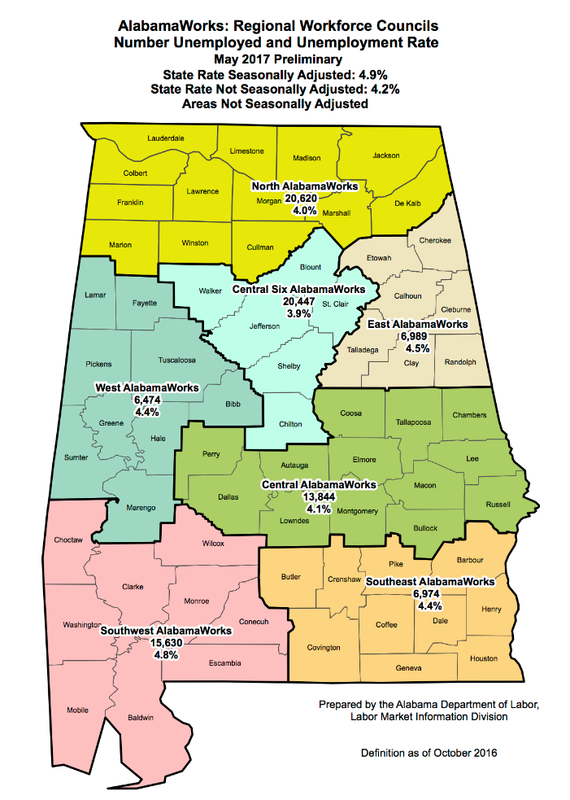 “Our regional footprint for Region 7 remains the same and includes the nine counties in Southwest Alabama — Baldwin, Choctaw, Clarke, Conecuh, Escambia, Mobile, Monroe, Washington and Wilcox. “Our mission remains the same. As an employer-established and employer-led nonprofit organization, we will continue to develop strategic partnerships that attract, educate and train students and workers to better meet employer needs and foster economic growth in a global marketplace. “And finally, our body of work remains the same. We will continue to engage our industry clusters, influence the system of education and training, and inspire the supply of future workers as we strive to reach the vision to create a fully comprehensive, integrated workforce development system ensuring that our customers have a high-quality workforce needed to compete in today’s dynamic economy. West AlabamaWorks is merging the strengths of the faith-based community, postsecondary education and workforce development partners to create a Prisoner Re-Entry Ready-to-Work Initiative. A key partner is Church of the Highlands, which has been working with correctional facilities for five years, offering assistance to thousands of inmates. More than 2,000 inmates attend church each Sunday and participate in small groups in the 14 correctional facilities Church of the Highlands serves. Church of the Highlands partners with LifeLink, a nonprofit service provider to the Alabama Department Of Corrections, to deliver content to ex-offenders and offer instruction in areas such as soft skills. The University of Alabama School of Commerce also provides adult education to inmates. West AlabamaWorks partnered with Church of the Highlands to address the needs of ex-offenders who will re-enter the local community. The goal of the partnership is to utilize a structure to teach soft skills, which are essential in obtaining and retaining employment. If ex-offenders re-enter their community job-ready, they are less likely to re-offend. Adding the Ready-to-Work program taught at Shelton State Community College — which was created by AIDT and modified by industry — is another significant part of the partnership. Ready-to-Work classes will start in January 2018 at the Bibb County Correctional Facility. Local employers, such as CEMEX and Ready Mix USA, are committed to hire graduates of the Prisoner Re-Entry Ready-to-Work Program. 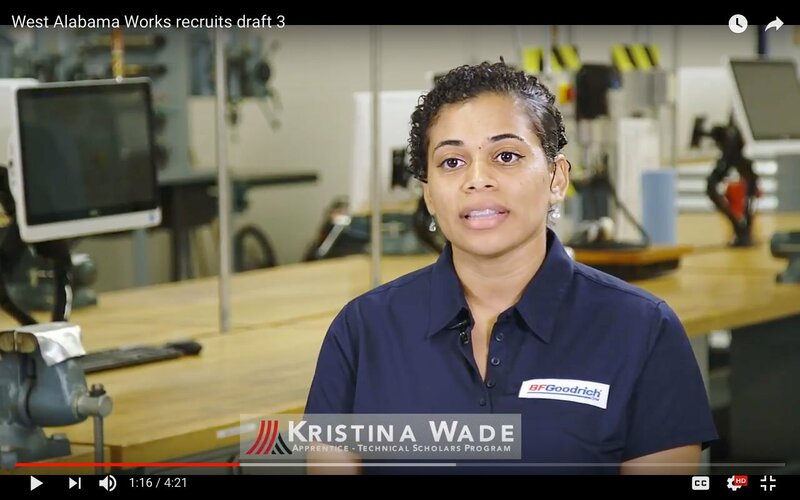 West AlabamaWorks recently unveiled its second apprenticeship video. The video focuses more on the actual apprentice rather than recruiting businesses to participate in Apprenticeship WestAlabama. 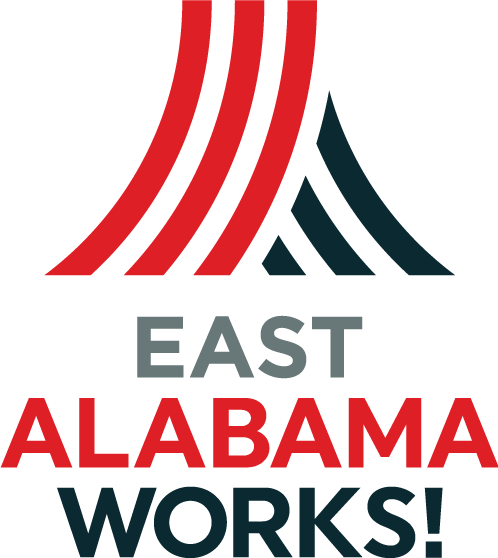 East AlabamaWorks is holding its Quarterly Workforce Summit today, Tuesday, Sept. 19, at Gadsden State Community College. Anyone interested in learning more about workforce development and labor market information from the Alabama Department of Labor is invited. Guest speakers are Jeff Lynn, vice chancellor of the Alabama Community College System, and Tonya Lee, assistant director of Labor Market Information for the Alabama Department of Labor. The summit is from 1 to 3 p.m. in Room 210 of Gadsden State’s Joe Ford Center, 401 Korner Street, Gadsden. For more information, please email East AlabamaWorks Executive Director Lisa Morales at lmorales@eastalabamaworks.com. Nearly 10,000 eighth-grade students from across nine southwest Alabama counties will converge Sept. 20 and 21 on the Mobile Civic Center for the 2017 SAWDC AlabamaWorks Worlds of Opportunity Career Expo. Some 5,000 students per day will be exposed to in-demand occupations, immersed for roughly 90 minutes per wave in an intensive, hands-on career exploration guided by volunteer mentors from key south Alabama industries. The SAWDC WoO Steering Committee worked for six months to plan this year’s expo. For more information, visit worldsofopportunity.org. West AlabamaWorks’ third annual Worlds of Work will be Oct. 12 and 13 at Shelton State Community College’s Martin Campus. There will be only one day, Oct. 12, for WOW Varsity, an event that targets area high school and postsecondary students. Updates will be available on Instagram, Twitter and Facebook. For more information, visit worldsofwork.com. Gov. Kay Ivey recently announced the Governor’s inaugural Disability Job Fair will take place during National Disability Employment Awareness Month in October. Ivey made the announcement at United Ability, formerly United Cerebral Palsy of Greater Birmingham, following a tour of its facility, which provides a wide range of programs to assist children and adults living with disabilities. 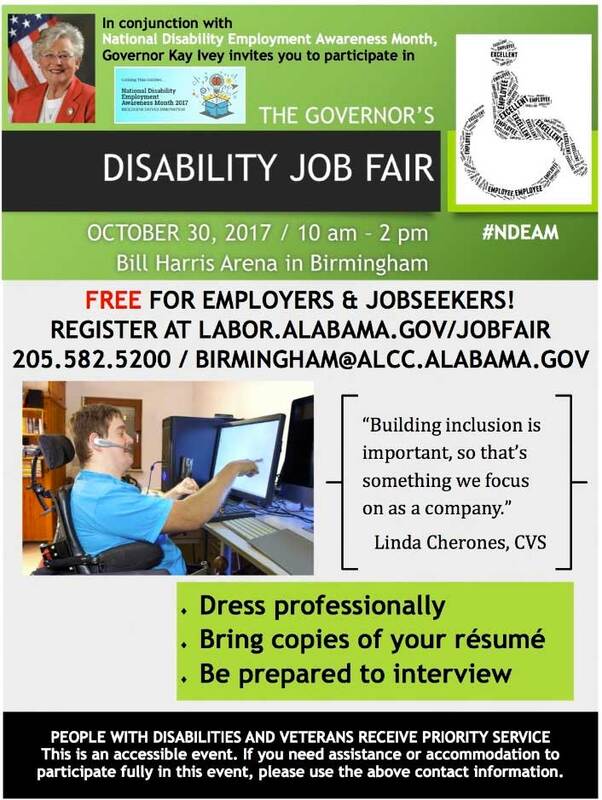 The first Governor’s Disability Job Fair will be held on Oct. 30 from 10 a.m. to 2 p.m. at the Bill Harris Arena in Birmingham. The job fair is being made possible by a joint partnership between United Ability and several state agencies, including the Department of Labor, Department of Mental Health, Department of Rehabilitation Services and the Governor’s Office on Disability. According to a 2015 American Community Survey, 14.9 percent of Alabamians living with a disability, 21,283 individuals, are unemployed. For more information, click the flyer below. Also, read AL.com’s story about the job fair. The Academy of Craft Training in Birmingham is continuing to get media attention. The academy, operated out of AIDT’s Alabama Workforce Training Center in Birmingham, is now in its second year and includes nearly 160 students from 24 Birmingham-area schools. 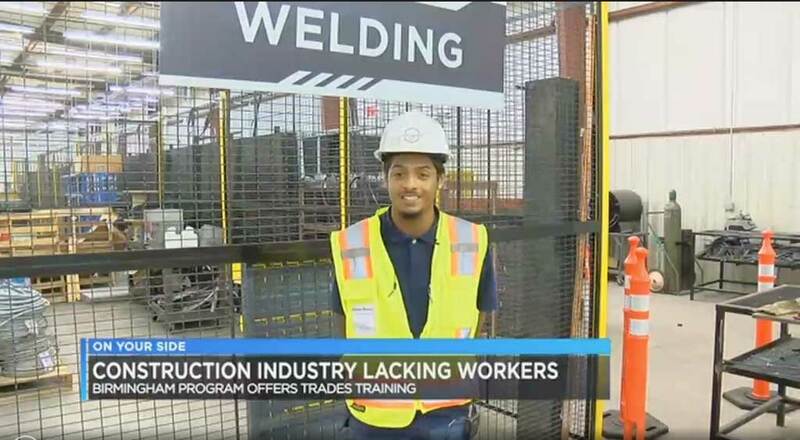 The academy was recently featured in a segment on WBRC/Fox 6 in Birmingham that also looked at the shortage of skilled labor in the construction industry. The academy trains and links high school students interested in the construction crafts with businesses that need skilled craftspeople. The Academy of Craft Training is the brainchild of the Associated Builders and Contractors of Alabama (ABC), in partnership with the Alabama Department of Education’s Career and Technical Education Department (CTE) and the AWTC. ABC of Alabama recruits the students and provides the instructors. The CTE provides the equipment and transportation for students, and the AWTC provides the space. Students who successfully complete the two-semester program are guaranteed a job offer in their chosen fields: building construction, masonry, HVAC/plumbing, electrical or welding. Click the image below to watch WBRC/Fox6’s story. 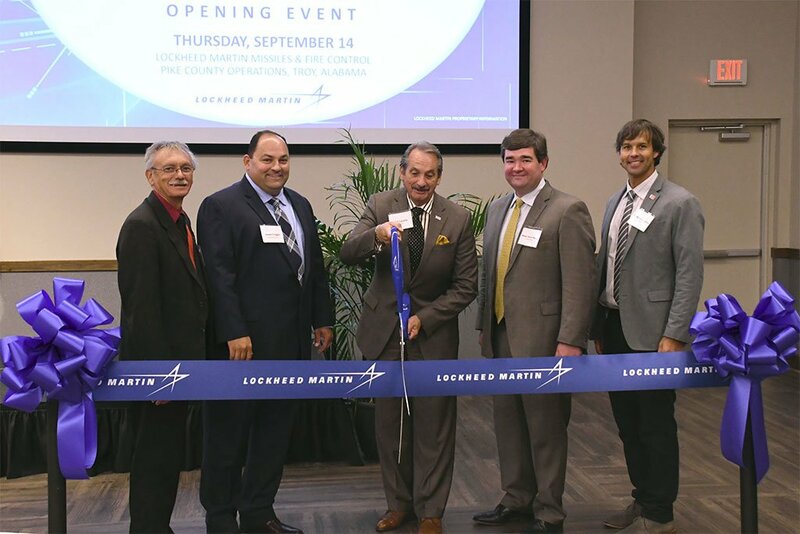 AIDT Executive Director Ed Castile cuts the ribbon at Lockheed Martin’s opening ceremony in Troy.